The Amazon rainforest is magical. Within it, Peru boasts a range of luxury Amazon lodge options to discover its incredible flora and fauna, which Aracari has tried and tested. I recommend Tambopata Research Center (TRC) for the most authentic jungle experience, where the luxury of staying at this remote lodge in pristine rainofrest is the unrivalled opportunity for widlife watching in Peru. 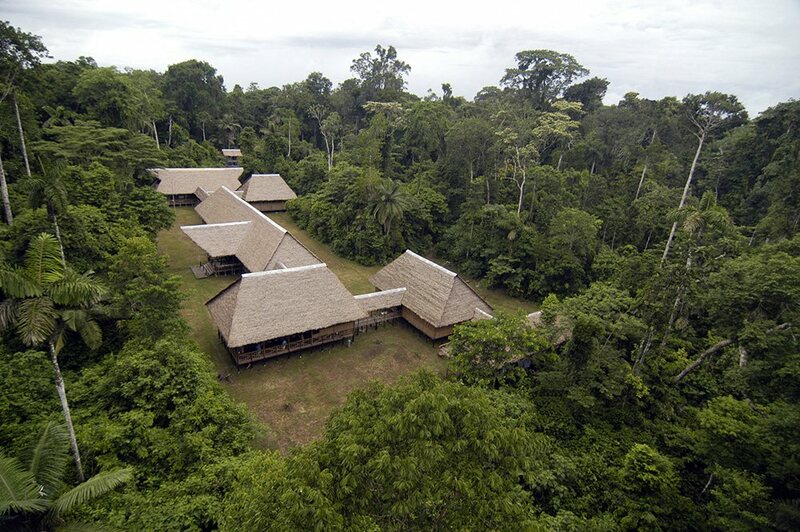 I first visited Tambopata Research Center, the only lodge within the Tambopata National Reserve, many years ago, and had always longed to go back. I had never forgotten the abundance of wildlife I saw and the opportunity to partake in the “Macaw Project”, which has been conducted there for over 20 years to bring guests closer to these magnificent birds. The highlight of Tambopata Research Center is therefore without a doubt its proximity to the marvellous macaw clay lick of Chuncho, where hundreds of these exotic macaws congregate daily to eat clay. This is a stunning multi-coloured spectacle – almost impossible to imagine – which firmly stuck in my memory. As soon as I heard that TRC was inaugurating luxury accommodation that would make it possible for more comfort-seeking guests to visit this part of the Amazon, I jumped at the opportunity to inspect them and to show my teenage son this wonderful place. 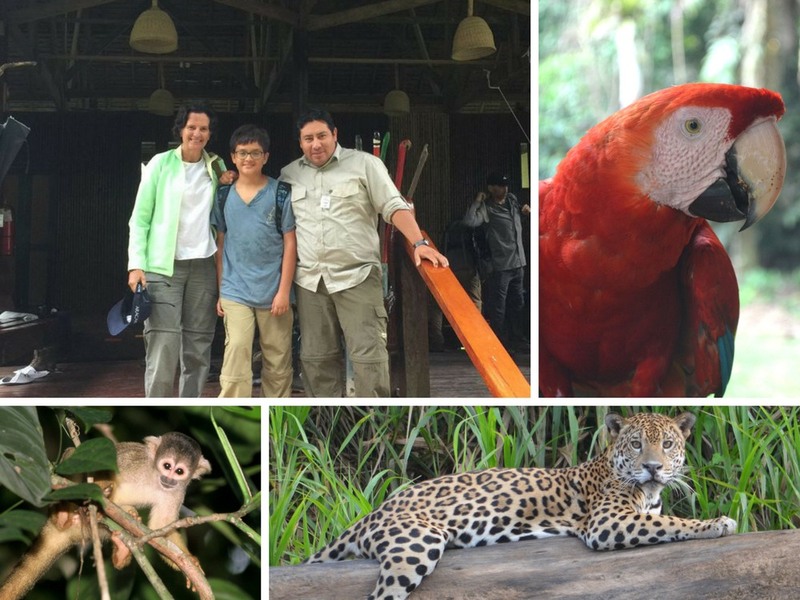 We went on a four day three night trip combining two of the three lodges that Rainforest Expeditions has in the Tambopata area: Refugio Amazonas and Tambopata Research Centre. The third they offer is Posada Amazonas. All three lodges are located on the Tambopata River, upriver from the city of Puerto Maldonado, the gateway to start a rainforest adventure in this part of Peru. 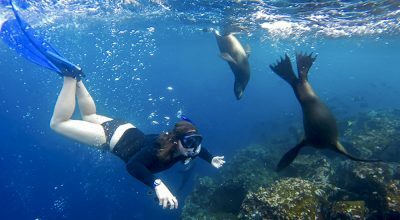 There are regular flights to Puerto Maldonado from Cusco and Lima. We stayed one night at the Refugio Amazonas Lodge, located a 1 hour drive and two and a half hours boat ride from Puerto Maldonado, followed by two nights at TRC (Tambopata Research Center) which is located a further 4 hours upriver from Refugio Amazonas. The stop is made at Refugio before reaching Tambopata Research Center to break up the river journey, considering it is Peru’s most remote amazon lodge. Tambopata National Reserve is 3.7 million acres of rainforest protected area – one of the largest in South America. It is surrounded by other National Parks and protected areas such as Bahuaja Sonene (Peru), Madidi (Bolivia) and Manu National Park (Peru). Sandwiched between the southeastern slopes of the Andes and the territory of what is now Brazil, this is the most pristine rainforest in both South America and the world, due to its inaccessible location. So, considering the inaccessible nature of this area, a total of 5-6 hours of travelling on a motorised canoe to reach our destination did not seem like a bad proposition! The journey time may, however, discourage some people who are in a rush and want to get to their destination quickly. 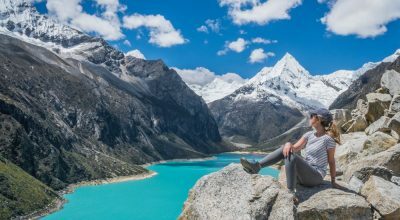 I hope, by sharing my experience here, I can persuade all those nature lovers to carve the time during a tailormade Peru trip to visit TRC for 4 days & 3 nights, or, better still, 5 days & 4 nights. This is a lovely 32 bedroom lodge one and a half hour from Puerto Maldonado. We didn’t stay long at Refugio Amazonas, en route to Tambopata Research Center, but enough to enjoy its comfortable facilities. 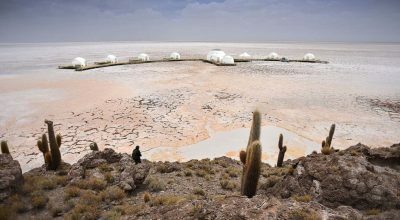 All rooms have ensuite bathrooms with hot and cold water and communal areas include a restaurant, lounge and a very nice bar (serving delicious pisco sours). Massages are also available on request. There is electricity at the lodge, on three times a day: in the early morning, mid afternoon and evening. On the way here, in the late afternoon I was delighted and impressed to see a large group of capybaras eating and resting on the banks of the river as well as a caiman and numerous rainforest birds such as snowy egrets, amazon king fisher and horned screamers. In the evening we attended the “Wired Amazon” Talks. Wired Amazon is a collection of citizen science projects. On my visit, the talk was focused on new moth species captured with light traps, and about the breakthrough in the study of elusive rainforest wildlife through the use of camera traps that activate when they sense movement or heat – and which take footage of animals rarely ever tracked. The Wired Amazon programme of Rainforest Expeditions is designed involve their guests with scientific activities that are being carried out in the forest, so that members of the public can thereafter help scientists to identify fauna and flora and new species from their computers back at home. At the lodges, visitors have the opportunity to partake in wildlife investigations with scientists in the field, like setting light traps, camera traps or counting species. It is a wonderful initiative which does allow visitors to learn involved and learn about the forest first hand. At dinner we sat and chatted with Daniel, the head of the project who enlightened us further with the work they are doing onsite. We also had the opportunity to climb on the 30 metre observation tower at Refugio and see the canopy activity at dawn. One of the mysteries of the forest is the parallel life that exists in the canopy and in lower levels of the forest. It is difficult to imagine until one visits. On the way to the tower we saw and heard capuchin monkeys overhead. The climb is not particularly strenuous and offers amazing views. Refugio Amazonas has a menu of at least 10 different types of activities to carry out while staying at the lodge, including rainforest walks. What you normally do is very similar to a safari routine. You go out in the morning with your guide and other travellers, depending if you have a private or shared guide, for a 2 -3 hour activity, then return to the lodge for lunch, and then go out in the afternoon until dusk. You can also choose to go on a night walk or go on the “Wired Amazon” activities. On day two of our adventure, we travelled to Tambopara Research Center, 4 hours upriver from Refugio. As soon as we passed the control point, which marking the border of the Tambopata National Reserve, located one and a half hours before TRC, we left behind the numerous contraptions floating on the river where local people search for alluvial gold – causing massive pollution to themselves and the river – and left behind other lodges and villages. As soon as we approached the lodge, it was clear that the forest was more dense and its presence more intense. The forest where TRC is located is what is called primary forest: forest which is pristine and hasn’t ever been cut. That, plus the absence of human population, is the main reason for the abundance of wildlife. We reached TRC after a 20 minute walk from the bank of the river. A short walk from in the forest, where we encountered a group of peccaries (amazonian wild pigs), we arrived at the lovely rustic lodge of TRC, that I so well remembered, with its cheerful staff greeting us with a chilled welcome juice and cold damp towelettes for our faces. After a short briefing, we shown our room which was in a cluster of 6 rooms at the end of an elevated walkway. Wow were we impressed! 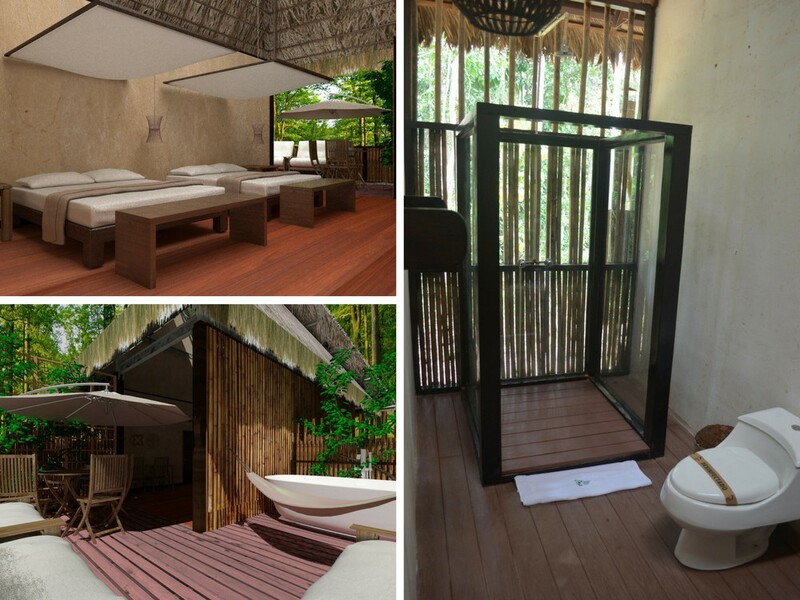 Our wonderful spacious suite, with an terrace and a tub, ensuite bathroom with shower and had amazing rainforest views. I have to say the fact that the rooms at TRC and refugio are open to the forest is certainly daunting, but you get used it, especially because of course beds have large screens that will protect you from any bugs. TRC will have 18 of these swanky rooms in two different blocks at the back of the lounge and bar. In addition, it has more simple rooms, also with private bathrooms (some ensuite some not) in the main block where the reception and restaurant are located. This is not a five-star luxury lodge, rather the luxury lies in the experience. Nonetheless, the accommodation is comfortable and connects you with nature. At the bar the pisco sours are also amazing and the food delicious, served, as in Refugio, with a buffet format for breakfast, lunch and dinner. 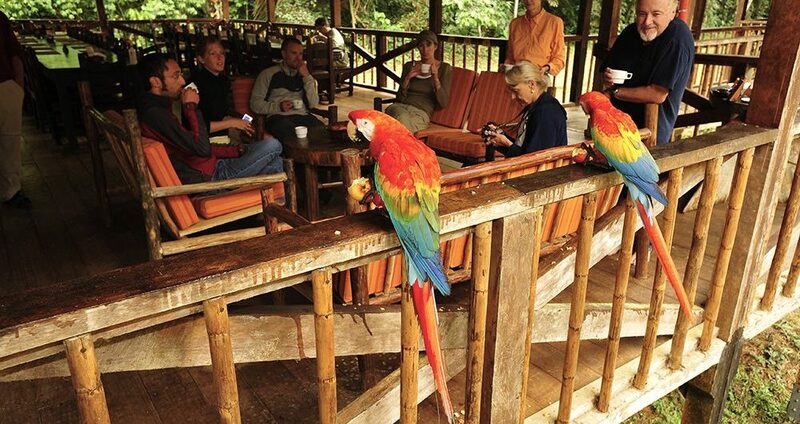 The best bit however at TRC are the frequent visits during mealtimes of the “chicos” or scarlett macaws that have been raised at the lodge as part of the Macaw Project which is still under way. These macaws are wild but they frequently visit their “home” and take advantage of any opportunity to steal some other guests food, which provides great excitement and fun to visitors…not necessarily so much to staff! We went on a rainforest walk where we saw red howler monkeys, bullet ants and agouti. The highlight of our walk was seeing a massive tarantula…. they are called “araña pollito” (translating as chicken spiders), as our guide claimed that species of spider had managed to eat a whole chicken! During our walk at dusk we stopped at a lookout point over Collpa Colorado, one of the macaw licks that are near the lodge and see the stupendous sunset over the Tambopata river. But the main highlight of our stay at TRC was without a doubt our dawn visit to Collpa Chuncho, the largest and most popular lick — among macaws—. Red and Green, Scarlett, and Blue and Yellow macaws and a variety of parakeets gather here at dawn to eat clay, which they need to complement their diet. They gradually come together, from dawn onwards and and perch on the trees and the clay surface, until the whole area is covered in colour in the most unbelievable spectacle… and then suddenly when something scares them and they take flight the sky is covered by what looks like a moving rainbow. Once back at the lodge, after dinner a talk by one of the biologists working on the Macaw project made the whole experience come to life. 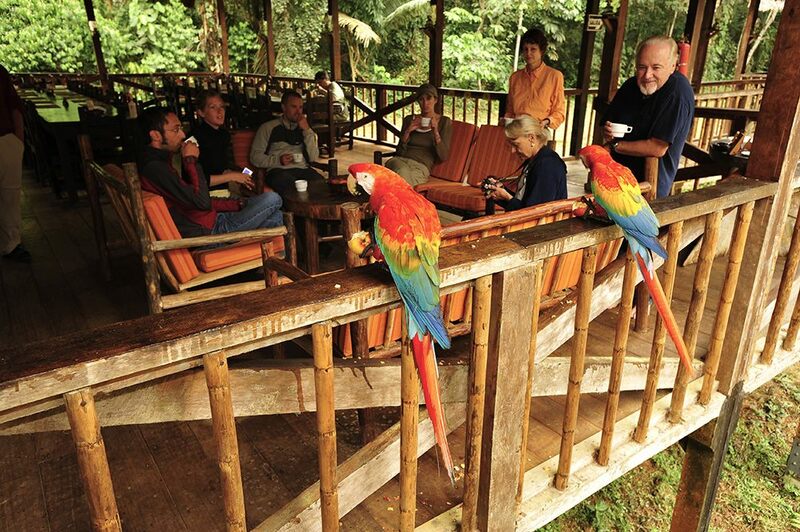 The real luxury of Tambopata Research Center lies in the luxury of the wildlife experience. 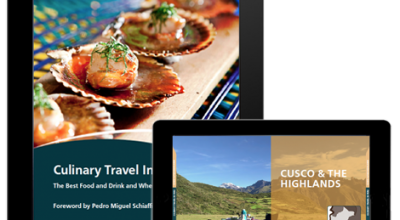 For those seeking the more traditional luxury of hotel comforts, we’d suggest Inkaterra Reserva Amazonica, which offers a la carte guided excursions, or Inkaterra Hacienda Concepción. These two properties are much closer to the city of Puerto Maldonado, therefore quicker to get to, although less deep into the rainforest to see wildlife. Adventurous families would also be well-suited suited to opt for Refugio Amazonas.